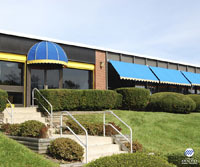 Aristocrat Commercial Awnings are precision manufactured by Craft-Bilt Manufacturing Company in Souderton, Pennsylvania. Since their founding in 1946, Craft-Bilt has been dedicated to quality products and customer focus. 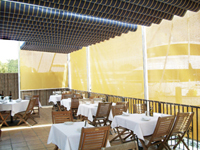 They are experts on the design and production of commercial awnings. Their design team routinely works with architects and builders to specify products that meet building codes and engineering requirements. With today’s emphasis on green building certification and the need to conserve resources and reduce energy costs, business leaders are considering awnings for office buildings, factories, apartment houses and restaurants. Contact Suburban Construction to find out how we can meet the special needs of your project. 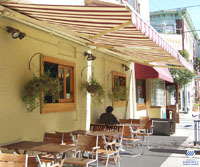 Shelter patrons using your outside dining from the heat of the sun - retract the awning when the weather gets cool! We can also supply a Solar Shade awning option for your business! Click here to see the details. Add a finishing touch to your office building with Commercial Window Awnings and Door Canopies by Aristocrat. Commercial awnings bring much valued shade, substantially lowering air conditioning bills and preventing sun glare inside. Commercial awnings call attention to your store or business while sheltering your entrance! Commercial retractable awnings come in a variety of colors and styles to attract customers to your business. Aristocrat Commercial Awnings can be made with your logo, business name, street address, telephone number and website. Use commercial awnings over an entryway or to shade a store window. 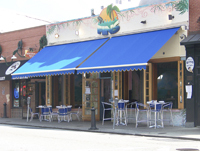 Use commercial awnings as advertising, to help brand your business with your logo and signature colors. Commercial awnings will lend a distinctive look to your office building and make giving directions easy - "Look for the building with the bright red awnings!" All Aristocrat commercial awnings are custom made and professionally measured. Aristocrat Commercial Awnings from Craft-Bilt Manufacturing Company are custom built in their factory to your specifications. 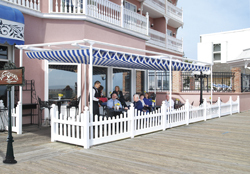 Suburban Construction will visit your place of business and help you decide the best placement for your awnings. We will check the available mounting height, and recommend the best styles for your application. Working with your corporate colors or building architecture, we can help you find fabric that will complement your image and make your building stand out from the rest! Below are Some Videos of Commercial Awnings! Seamlessly Blending Inside and Out - for added comfort, energy savings and privacy for your place of business! Our most versatile sun protection - retractable canopies create outdoor seating areas that provide comfortable shade for your customers! Open or close as needed, manual or motorized options available. Canopies can be fitted with solar shade curtains on any or all sides for added light control and privacy. Installed freestanding, mounted to a wall or beneath a pergola - these unique structures are custom sized to fit your space and can be joined to fit large areas. 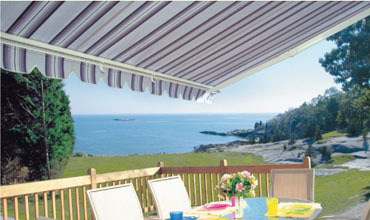 A great alternative to traditional awnings. Please enter the number 42798 in the box provided below.